The Punjab police today took a giant stride towards effective countering of the menace of narcotics in the state with Patiala police making a hug recovery of synthetic drug worth Rs. 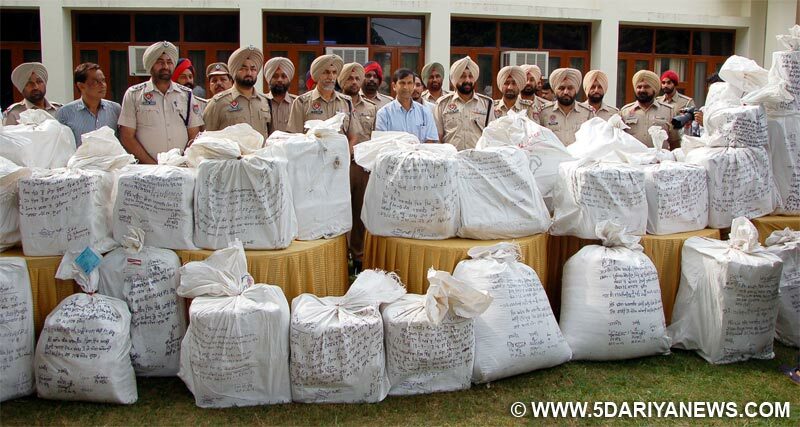 100 crore by arresting five inter-state drug smugglers.Disclosing this here today, the Punjab ADGP/Law & Order Mr. Dinkar Gupta accompanied by Patiala SSP Mr. Hardyal Singh Mann and Rajpura SP MR. Bhupinder Singh Khattra, said that the Patiala police has made a major breakthrough by recovering synthetic drugs worth Rs. 100 crore namely Parvon Forte, Parvon Spas, Proxyon, Spasmocip pluse made from Dextropropoxyphene hydrochloride salt and banned through Narcotic Drugs & Psychotropic Substances Act 1985. This huge cache of drugs has been recovered from Karnal based Pioneer Pharmaceutical & Prime Pharmaceutical Ltd as this pharmaceutical unit was indulged in making these banned drugs and further supplying these in various parts of the country through its wide network commission agents. Mr. Gupta informed that the recovered synthetic drugs include 90 Kg Diphenoxylate Hydrochloride, 65 Kg Codeine Phosphate and 25 Kg other Intoxication powder (total 180 kgs). Besides this, 7,10,000 capsules of Parvon Forte, Spasmocip pluse, 6600 bottles of Fancidryl , a cough syrup, 7 big bags containing blank shells of capsules and 10 other of material required for preparing these drugs have also been recovered. He said that Rakesh Kumar s/o Chaman Lal r/o Shivam Enclave, Delhi, Mahesh Kumar s/o Jagan Nath r/o Roshanara road, Delhi, Sanjay Kumar Puri s/o Late Kamal Kumar r/o Kamla Nagar, Delhi, Parveen Kumar s/o Krishan Lal r/o Shivam Enclave, Delhi and Kamal Raj Chawla s/o Roshan Lal Chawla r/o Preet Nagar, Ladowali Road, Jalandhar have been arrested by Rajpura police so far. He revealed that after three recoveries of synthetic drugs in Rajpura circle, the district police Chief Mr. HS Mann constituted a special team under Rajpura circle SP Mr. Bhupinder Singh Khattra , which after thorough investigation nabbed these smugglers. He said that the owners of Karnal factory namely Prithvi Singh Chaudhary and his son Pradipt Chaudhary had fled leaving their Innova vehicle No. HR-46 A-1499 during the raid of police party at their factory premises. He said the arrested people have disclosed during investigation about their links in states like Rajasthan, Uttar Pradesh, Delhi, Gujarat and some other states and the Punjab police was fully confident to catch few others big fishes from these states too. The ADGP further informed that as per the directions of Punjab Deputy Chief Minister Mr. Sukhbir Singh Badal, who was also holding the Home portfolio, the state government has launched a crusade against the drug trafficking. He pointed out that as a result of a focused and concerted drive against drug trafficking, particularly high-grade drugs like heroin, emphedrine, methamphetamine (ice), and even other drugs like poppy husk, seizures in the state have increased manifold. He further said that the increase in drug seizures has resulted from a sustained drive by the state police against drug trafficking, by adopting a zero-tolerance policy. In a recent meeting held by Sh. Sumedh Singh, IPS, Director General of Police of all the SSPs, Police Commissioners, Zonal IGPs and Range DIGs, clear directions have been issued to all field officers to crack-down on drug trafficking by exposing trafficking rackets in a complete and end-to-end manner by unveiling the Pakistan suppliers, trafficking routes adopted, couriers used, the main smugglers and the recipients of the consignments of contraband. He said that after disrupting supply chain of drugs, the state police was committed to totally block the flow of drugs to save the youngsters from falling prey to this menace. He revealed that 181 Punjab police helpline was turning to be a great source of information on drug pedaling as it has received around 100 useful tips on such activities indifferent parts. Appealing the people to be more proactive in providing vital information on drug pedaling, Mr. Gupta also urged the drug users to get them registered on this helpline to take benefit of state police’s drug de-addiction process throughout the state.The ADGP said that the border zone has identified and registered FIRs against 52 top smugglers as per the policy directive to go right after the source and ensure that the smugglers, along with recipients are booked and arrested.